This is my next weathering project. 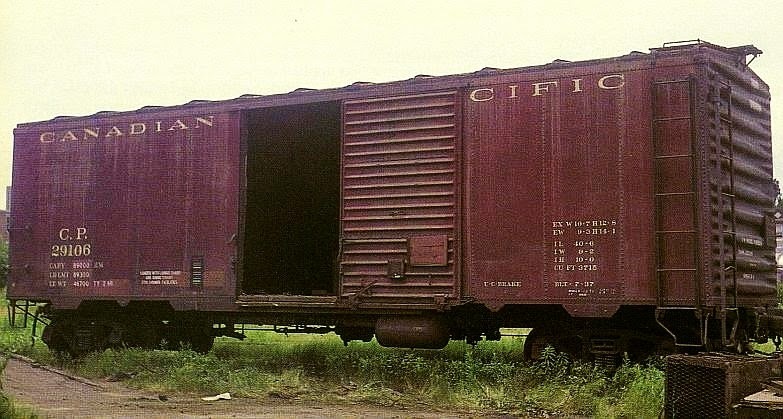 It is as you can see a Canadian Pacific liveried 40-foot steel boxcar with Youngstown style doors and roof walks. The colour is more maroon than the pic…it is showing slightly redder than the actual model. I believe roof walks were phased out of service by the late 70's. This particular car is showing a July 1937 build date. It already has had a spray of dullcote applied to it. So my next job is to remove and discard the plastic Accumate couplers and remove the wheels and trucks for painting. I've found only one pic on the web of this type of boxcar in this particular Canadian Pacific livery, and its colour is extremely close to that of the model. So this will be my weathering "template" if you will.